Abergavenney, solo exhibition abstract works. 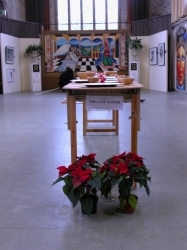 December 2003/Jan 2004 – solo exhibition St Mary’s Hall, St David’s Cathedral. 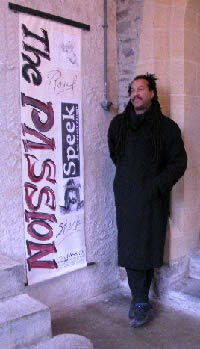 Paintings and installations exploring faith and culture. 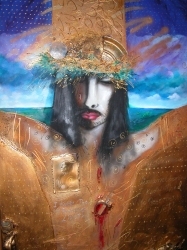 Pieces are in different media including found work used to form 'The Crown of Thorns'. Central work 'The Annunciation' created using techniques from the 15th century drawing the outline on paper, pricking through onto canvas using coloured pastel chalks.